The Short Answer: A thrilling intersection between broken techno and UKF dubz made on the margins of the underground. Somewhere between London garage and Berlin dub techno is Spatial and today we’re happy to premiere the video for the single “Bring Me Joy.” In the video, Andy Cooke of Junior Aspirin has assembled clips from various 80s films including one of my favorites, The Labyrinth. 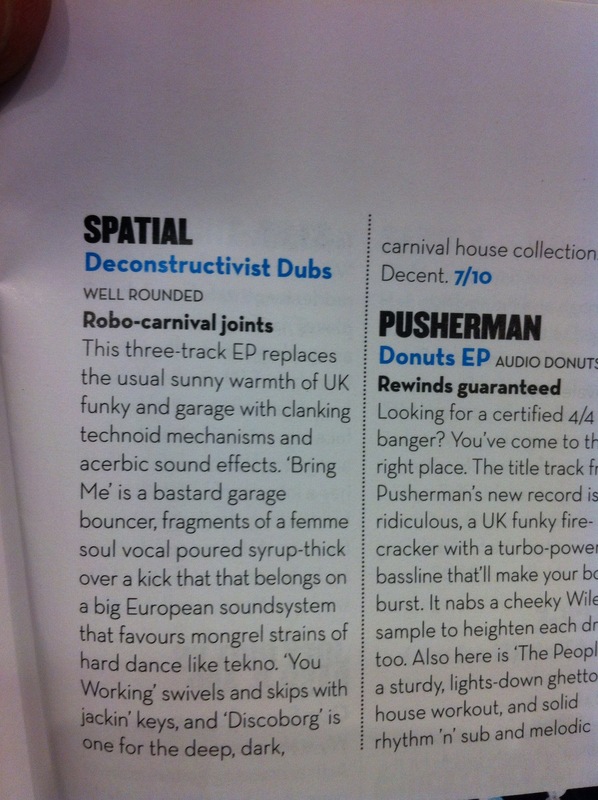 “Bring Me Joy” is on Spatial’s 3 track ‘Deconstructivist Dubs’ 12″ EP and will be released on Well Rounded Records August 6th. SPATIAL – ‘Bring Me Joy’ Video Edit (Well Rounded Records) from Well Rounded Records on Vimeo. Infrasonics label boss Spatial takes a trip beyond his own label for this new three track release on Well Rounded, dropping an absolutely mighty tune in the shape of crisp and dry 2-step tech monster “Bring Me”. Alongside the choppy thrills of that opener, “Discoborg” boasts a demented set of disjointed stabs over an equally airless beat, while the rooted-noted techno of “You Workin’” slowly builds into a gloriously far out and head-expanding delight. Sleek, functional explorations on the techno/garage axis here from Infrasonics boss Spatial on the varied and stimulating Well Rounded record label. Rhythmically interesting and well executed, these tracks are sure to be great dancefloor devices – looking forward to playing these out. Minimal and Future garage mechanic Spatial drops three cuts of sheer, swinging syncopation for the ‘floor. These are his first new productions since the release of his ’Infra001-4’ compilation and find him applying a more fleshly palette of disco, dub and electronics to his efficient rhythms. On ‘Bring Me’ he’s contrasting cold and technoid Garage roll with an infectious vocal stab, kinda somewhere between Sensate Focus and Cooly G, while ‘Discoborg’ seeps Soundhack-style strings and and quicksilver synth rushes through a filigree funky rhythm, and ‘You Workin?’ jacks on a fidgety 4/4 garage vibe scrawled with dotty electronics and flash hooks for the friday night set. The man known simply as Spatial keeps a pretty low profile and doesn’t generally venture far from Infrasonics, his label and production home base. But with likeminded outsiders like xxxy and Ike Release holding down the label’s last handful of singles, Spatial has begun venturing outside the palace walls, offering up an original and a remix on a split with S-Max for Bristol’s Schmorgasbord Records project. His first full release in earnest for another team, Deconstructivist Dubs, goes to Well Rounded, where xxxy recently turned in some of the most distinctive music of his career. Though he politely passes on the overt party vibes xxxy so vehemently grabbed by the horns, Spatial does let some sunlight into his characteristically Spartan bass universe. “Bring Me” reveals he’s still trading in shaved-down drum patterns and carefully placed bass notes, but trace levels of playful melody give a female vocalist enough of a scaffold to lay down a hook. Though still crispy and all-business, Spatial’s drums trend funkier on “Discoborg,” with a solitary bass note acting the straight man to punchy synths and an ever-thickening cloud of strings. Were it not for well-placed female coos, what sounds like a low-bit trombone and some late-to-the-party zaps, “You Working” could pass for straight-up techno. I wouldn’t say Spatial’s stoic façade is crumbling, but Deconstructivist Dubs sure seems to be smiling.